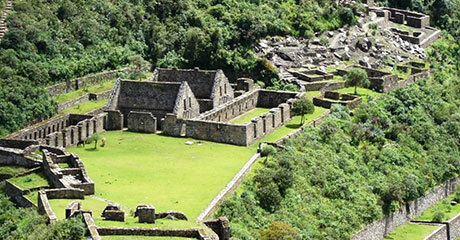 Considered as the last Inka refuge which resisted per decades to the Spanish conquerors. It is located in the canyon of the Apurimac River to an altitude 3.030 m.a.s.l. in a strategic geographical area between andean mountains and the edge of the jungle, although, it is difficult to access here it is not impossible and above all it is a challenge and an exciting experience for those who enjoy adventure. We will pick you up at your hotel between 4:00 hrs to 04:30 hrs. in order to leave at 04:40 hrs. Using a private transportation towards CACHORA, small town located at an altitud of 2800 m.a.s.l. 3 hours far from Cusco. Along the way we will be able to observe diverse landscapes that belong to different climates, until we arrive to San Pedro de CACHORA where we will arrange our equipment to begin the long trek which will take us between 7 to 8 hours Along the way we will also be able to observe a diversity of flora and fauna that embellish our walking, to finally arrive to el Capulichayoc Viewpoint, from where we will be able to observe the deepest canyon in the world which is known as the Apurimac and by where the majestic Apurimac flows. It is here where we will have our first lunch. 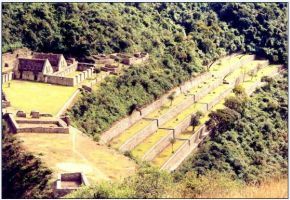 We also will be able to see the first sights of Choquequirao. We will continue with our walking until we reach CHIKISKA where we will spend the night. At dawn and after breakfast we will continue our trip. This time we will have to ascend until we get to MARCAPATA, where we will arrive after two hours walking, we will be surrounded by nature which will surprise to us, here we will have lunch to continue towards Choquequirao. After lunch, we will have a guided visit. At the end of the visit, we will agree on where to spend the night, we can stay on this place or camp in MARCAPATA. It will be up to us. After breakfast, we will return by the same way descending to the Apurimac river, and then to CHIKISCA where they will be waiting for us with a delicious lunch. After which, we will get ready to continue our walking, this time it will take us to Aguada, place located at 2600 m.a.s.l. It is there where we will spend the night. After breakfast we will continue towards CACHORA, this will take us around 2 hours, from CACHORA we will go to CONOQ water springs, also, to the archeological site of SAYWITE by bus. Spending the night there. After an early breakfast we drive to the city of Cusco. All buses leave from the Inca Trail to passengers in the Plaza San Francisco, you must self back to your hotel.